This is an imaginary story which may or may not ever happen. It begins with Lois driving on a highway outside Metropolis on a stormy day. As she is driving, she is making celebration plans because this day is the first anniversary of her marriage to Superman. As luck would have it, at the exact moment her car goes past a large fuel storage tank, lightning hits the tank and the tank explodes. The explosion sends out flames engulfing Lois's car. Superman, flying overhead, sees what happens and flies to her rescue. He blows out the flames, but as he nears the car, Lois gets out, totally unhurt. "It's all right honey, not even an eyelash was singed" Lois tells him. It is then we find out why. Sometime back, Superman had given Lois a molecular-shield serum he brought back from a trip to Star Gamma-X. He injected her with it and it made her totally invulnerable to any type of physical harm or injury, which is what allowed him to marry her, knowing he would no longer have to fear his enemies striking at her to get to him. He and Lois then fly off to have a soul food dinner at Kenny's Kitchen to celebrate their first wedding anniversary. The scene shifts to a conference taking place at a manor house miles away on the coast, outside Metropolis. The conference is between Professor Ulvo and his assistant, Nether. The two scientists have been focusing an "F-D 33 ray" continually on Lois Lane. This device even allows the pair to see inside Lois and Superman's house, seeing everything on their viewing screen. They have had this ray focused on Lois 24-7, night and day. Eight days later, Superman arrives home and finds Lois knitting a little pink sweater. He automatically guesses the truth, hoping it will be a boy, while Lois feels certain it will be a girl. Knowing this about Lois's condition, Ulvo tells Nether that phase one of their plan is complete, and now it is time to switch to the "E-R 17 ray", which will be focused on Lois for the duration. They also prepare a special gift to be sent to Superman's house when the right time comes. Months fly by. Superman is in space, preventing a runaway satellite from colliding with an Apollo space ship. He flies home, and approaching his house, hears the crying of a baby. While he had been gone, Lois's time came and the doctor arrived at their home. "Mother and child are doing well" Lois tells him. Then she asks "Don't you want to look at your son?" Her next question is "Isn't he the most beautiful baby you ever saw?" Superman replies (a somewhat startled expression on his face) "W-Why y-y-yes,... I-I-It... H-He is--". Ulvo and Nether are watching what is taking place. Nether comments that Superman has no idea that their rays are responsible for this very special baby that Lois and Superman are the new parents of. They prepare to send the present they have for the new baby. Lois and Superman received many baby gifts from the public, with Ulvo and Nether's present among them. When he's in public, neighbors ask Superman about seeing his son, but he makes an excuse and flies off. Arriving at home, Lois tells him it's the baby's feeding time and asks Superman to do it. He tries to spoon feed the child baby food, and for the first time we see the baby. He looks fine, except for an enormous brain and no hair, and even though he's only one week old, he talks like a Harvard graduate. He tells Super-dad that he doesn't want that "goo", he wants a sirloin steak - rare, french fries, and a salad with Italian dressing. The baby food gets thrown back in Superman's face. A bewildered Superman cries out "LOIS!!" Over time the new parents do their best to raise super-baby, but he is often very demanding in his wants, and he can be rather insulting in his responses if he doesn't get what he asks, or if they fail to understand what he is telling them. Despite Lois's best efforts at cooking, the meals don't suit him. He complains about his room, and he hates it when they occasionally talk baby-talk to him, calling it "goo-goo infantile prattle". On his blackboard, he completely re-wrote Einstein's theory of relativity, believing he had proven it was outmoded. Superman disputes that, so the two fly off into space, super-baby determined to prove he is right. His theory is that time is a circle, not a curve according to Einstein. The speed they traveled at turned Superman into a baby, and super-baby into an adult, even though their minds were unaffected. Superman asks "But what if we don't change back to our former shapes?" Super-baby responds by asking "Super-dad, don't you realize I'm ALWAYS right?" Sure enough, when they returned to Earth, they returned to their original physical forms. Professor Ulvo and Nether have been watching all of this play out on their viewer, knowing the next part of their plan is about to begin. Up to now, Lois and Superman had not yet decided on a name for their super-son. As they are discussing it, they decide to peek in on him in his room, believing he is asleep. It turns out, he sleeps with one eye open so that he can still perform tasks, in this case disproving Newton's theory of gravity. Super-baby gets disagreeable again, throwing the science book he was reading, and complaining that it's too elementary for him. "The idiocy of your world, basing space travel on the principle of an apple falling!" Superman tells Lois that the "brat" has him climbing the walls and it's getting to the place that he has trouble concentrating on his most vital missions. That distress doesn't prevent Superman from continuing his regular patrol. At sea, he encounters a hurricane that is threatening both a coastal lighthouse and a luxury liner at sea, not far away. Superman decides there is only one thing he can do. He flies up to the top of the hurricane, and with a super-clap of his hands, creates an explosion with the force of an atomic blast that breaks up the hurricane. Returning home, he tells Lois what he did, when super-baby complains "You could have caused incalculable damage, thanks to your usual stupidity! My calculations show if the explosion had been twenty feet higher in the atmosphere, there would have been a chain reaction which would have destroyed the Earth!" Superman asks Lois "Was I really that careless?" Lois replies lovingly "Forget about what might have gone wrong, just remember that your plan worked." Over the next few days, Superman just sits around the house, worrying that he might make another mistake if he goes out. Lois attempts to cheer him up by showing him one of the gifts that was sent to them for the baby. She pulls out the package that came from Ulvo and Nether. The gift is a large jig-saw puzzle that Superman attempts to assemble in the air at super-speed, but the assembled puzzle doesn't show a picture of anything. Super-baby berates his dad for not seeing that the individual pieces were camouflaged and to see the true picture required pressing a tiny spring on each piece. Having done that, the puzzle is revealed to be a picture of a coastal manor. Super-baby tosses a few more insults at his dad, calling him a dunce, then he melts the window with his heat-vision and flies out saying he's bored and they haven't got the brains to teach him anything new. A panicked Lois tells Superman to stop him. Superman replies "How? He's a greater genius than Da Vinci, Newton, and Einstein combined, and he makes ME feel like a baby!" Super-baby figured out that the picture in the puzzle was a real place, and he finds it on the coast outside Metropolis. Flying in a window, he meets Professor Ulvo and Nether. The Infant of Steel immediately recognizes the device that is the combined F-D 33 and E-R 17 ray machine, and Ulvo explains it was focused on his mother during the entire process. It magnified his cerebral cells far beyond Superman's ability to handle. Then they show super-baby the nursery they built for him, which is actually a modern laboratory with the most up to date equipment, the latest technical books, lab equipment, and computers, even electronic music! Ulvo reveals that he has a gang, and his expectation is that with Superman's confidence shattered, his gang can raid Metropolis unhindered. Kicking over a six-foot globe of the Earth, super-baby informs them that he has the super-powers and super-brains, and it is he who will lead the gang. First Metropolis, next the world, and then... the planets! Ulvo says to Nether "I've created a super-baby Frankenstein!" A few hours later, at Metropolis Airport, the engines of all the jets on the runways have stalled on takeoff, stranding them and blocking the planes in the air from landing. Super-baby flies in, announcing to the airport authorities that he is responsible. He wants a tax of $1,000 dollars on each plane, otherwise he will stall the engines of the planes in the air. Ulvo and Nether stand with him as he makes this demand. The airport police attempt to arrest the gang, but super-baby heat-visions their guns and the airport cops drop them. At that moment, Superman arrives and uses his super-breath to knock down super-baby's gang. He warns his son to give up this life of crime so as not to break his mother's heart, but super-baby declines, using his super-breath back at his dad. Reaching inside his cape, Superman pulls out a small box telling his son it's a gift for him, something priceless and unique. Superbaby opens it up and discovers a piece of green kryptonite. It has no effect on super-baby because earlier he had invented an anti-kryptonite serum. He throws the kryptonite away and then tells Superman "I have a deal for you". He offers his dad the anti-kryptonite serum formula in return for the two joining together, and as father and son, they would rule the world. Superman says "No deal!" Superbaby was about to threaten him, when he fell unconscious. Superman picks up the small form of his son, saying "Forgive me son, this was my only chance." At home, Superman explains his plan to Lois. Early on, he understood that the baby was dangerous because despite his fantastically developed brain, he had absolutely no sense of right and wrong. Before he gave his son the giant jig-saw puzzle, he fixed it so that when the baby touched the springs in the pieces, it sprayed him with a delayed-action cerebral neutralizer. There was just a small amount of kryptonite in it, enough to make it work. Lois and Superman go to the baby's room to get him to tell them the anti-kryptonite formula. To their amazement, there in the crib is their son, with a normal shaped head and blue/black hair. All he can say is "Da-Da, Da-Da!". The parents realize that the anti-kryptonite formula is lost. A few days later, Superman is out in the neighborhood, walking his son in the baby-stroller. A neighbor lady says "Look, it's Superman with his darling baby!" Superman thinks "My son is no super-genius now, what a relief. I can train him to use his super-powers for good... and someday he'll be the second SUPERMAN!" The last four pages of the comic make up this "Superman Album". Page one is a full-page picture of the Wayne Boring Superman telling readers that these pages can be used to start a Superman Album. He says "Cut them out and paste them in your own album!" Too bad more kids didn't do that and increase the value of my copy. Page two is a cut-out version of the first page story panels from Action Comics #1. Page three is a cut-out with pictures of the covers of Superman #1, Superboy #1, Jimmy Olsen #1, and Lois Lane #1. It is titled "Famous First Issues of the Superman Family". Page four is a full-page cut-out of the cover of Superman Annual #1 from 1960. "Kanigher's work on WONDER WOMAN in the 1950s and '60s dramatically expanded the series' mythology, in a manner comparable to Editor Mort Weisinger's expansion of the Superman mythos in the same period." Issue #224 is not your average Superman story, even for an imaginary story it was different. It clearly had some tongue-in-cheek moments, and some parts were fairly comical. It had some things about it that I liked, and some other things I thought were kind of strange. Prof. Ulvo and Nether reminded me in some ways of Emmett and Rollie Vale, the two nutty scientist brothers from the 2nd season "Metallo" episode of Lois and Clark. If there had been a 5th season of L&C, those two could possibly have been brought back to do an episode patterned after this story. I thought it was pretty funny to see Superman sitting around brooding about whether or not to use his powers. But where was Clark Kent? He's neither seen nor mentioned at any time in this story. It's as if when they married they just became Mr. and Mrs. Superman at home. No mention of Perry. or Jimmy, or the Daily Planet, or even of the fact that Lois worked there as a reporter. Most silver-age imaginary stories at least started from the regular continuity, and then diverged from there. This story appears to begin from a base continuity all its own. Then there's the issue of Ulvo and Nether having the means to see everything inside Lois and Superman's house, including the BEDROOM. I suppose it was a necessary element to tell the story this way, I'll just say I have a couple of issues with that. The section at the beginning of the story about Lois's car on fire and the molecular-shield serum didn't seem to be connected to the rest of the story, unless the reader is just supposed to take it by inference that it was the effects of the serum that made it possible for Lois to give birth to a super-powered baby. I thought Superman appeared to be an attentive and thoughtful husband and father, and I liked that, but the rest of the story is a little bit off-the-wall, for want of a better descriptive phrase. Humorous, but a little weird. Shortly after this, Kanigher wrote another unusual story, this time for Lois Lane #100, called "Lois Lane's Last Mile". In that story, Lois was on trial for the murder of Lana Lang. Superman and Batman investigated and discovered that the Lana Lang corpse was in reality an android of Lana, and that Lois was framed by aliens playing a variation of chess. Art - 4: When I was reading this story, something about the art reminded me of the art from Justice League of America, and then I noticed that the inker was George Roussos, who inked much of Mike Sekowsky's later work on JLA. It is also true that in the early 60's he did much of the inking for Jack Kirby on The Avengers. I was aware that different inkers can have the effect of altering the pencil work of an artist, but I think I understood that concept a little more clearly seeing the collaboration of Swan and Roussos, which I don't remember seeing very often. He uses a little more of a bolder inking, but I liked it. It was Swan, but it was Swan in a little different way, just like the story. Cover Art - 5: George Klein's role as inker to Curt Swan came to an end sometime in 1964. After that, Swan's pencil work was inked by a number of different inkers at DC, and one was Jack Abel. Besides this cover, the only other Superman covers that I recognize being done by the team of Curt Swan and Jack Abel are Superman #211 and Action Comics #369. However, I do know that Abel inked several Curt Swan Superman stories from around 1968-69. I am not certain to what extent it is Swan's penciling and/or Abel's inking, but this artistic style of Superman art over that roughly two year period is certainly one of my Curt Swan favorites. It's a little more realistic than Swan had done through most of the 60's, and while all his styles of penciling Superman are great, this style (to me) was very appealing. It had a quality to it that brought out the best features of the story characters. Recently I picked up a copy of the book "Curt Swan: A Life in Comics" by Eddy Zemo (I recommend it highly). It was very informative about many of the people over the years that inked for Curt while he did the pencils. Abel is only briefly listed among the names that are known for inking Swan's work on the Superman titles, but the Swan/Abel tandem holds a special place with me for Superman artwork over the years. 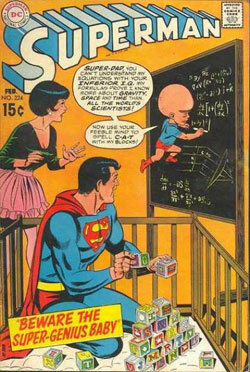 The cover scene with super-baby using his blackboard to re-write Einstein's theory while Superman arranges the toy blocks as Lois looks on, well captures one of the more comical scenes in this story. Also, if you look at the blocks, I think there's a tip-off that Curt Swan did the art, because four of the blocks have, in order, the letters S-W-A-N.